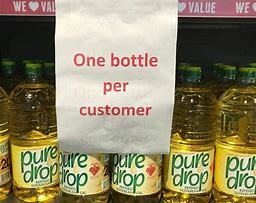 Cooking oil producers are struggling to access foreign currency from the Reserve Bank of Zimbabwe (RBZ) and the interbank market, which they need to import key raw materials, raising fears the country might face fresh shortages of edible oils if the situation persists. This also comes as banks have demanded cash deposits upfront, at the going market exchange rate, to match the amount of foreign currency cooking oil manufacturers may seek to buy from the interbank market. But Reserve Bank Governor Dr John Mangudya poured cold water on the claims by industry players that there was confusion and challenges around access to foreign currency by the cooking oil producers saying the companies know what to do, which they had always done in the past. “These people know what they must do. They may be misrepresenting facts. Isn’t it that they have been drawing down LCs (Letters of Credit) from Afreximbank, including the fuel importers,” the RBZ chief said, adding that there was no confusion over the issue. If importers are to get forex on the interbank they will need to fork out huge sums of RTGS dollars given that they will need to buy hard currency at the market rate instead of the previous 1 to 1 allocations by the RBZ. Industry sources said last week that they had written to the RBZ, through the Oil Producers Association of Zimbabwe, seeking clarification on a number of issues, including the exchange rate at which they should get the forex. In their correspondence, cooking oil producers indicated that some of their members had already run out of key raw materials, making it impossible for them to produce one of the important items in the food basket. The country currently requires an estimated US$250 million for importation of crude oil and soya bean imports annually, which translates to a monthly budget of US$20 million for the entire industry. Official estimates show that the country needs about 2 million litres annually, but faces intermittent shortages due to foreign currency challenges, as the country’s import bill continues to outstrip forex inflows. Local producers were responsible for meeting 95 percent of domestic consumption, although Government last year allowed people with free funds to import basics such as cooking oil following serious shortages. The Herald Business gathered last week that cooking oil producers were facing serious challenges getting foreign currency from the Reserve Bank of Zimbabwe or the recently introduced interbank market. In the 2019 Monetary Policy on February 22, 2029, the Reserve Bank of Zimbabwe indicated that manufacturers would get forex through letters of credit (LCs) or facilities guaranteed by the African Export and Import Bank. In his monetary policy statement last month Dr Mangudya said foreign currency for key commodities including fuel and cooking oil, would continue to be made available through LCs and or the central bank’s foreign exchange allocations committee. Industry sources said that cooking oil companies were now in a quandary regarding access to the foreign currency they need to import critical raw materials such as soya beans, crude soya bean oil and palm fats. Further sources claimed that previously, and in instances where the foreign currency was made available through RBZ, only selected players would get large chunks of allocations while other firms received nothing, which raised questions over fairness of allocations to the industry. Efforts to get a comment from Oil Producers Association of Zimbabwe (OSAZ) chairman Busisa Moyo were not successful, as he was said to be out of the country. Similar efforts to obtain comment from Finance and Economic Development Minister Professor Mthuli Ncube, under whom the RBZ falls, and secretary for finance George Guvamatanga also failed to yield results. But Olivine Industries acting chief executive Sylvester Mangani said after the MPS in February, they received further communication to the effect that cooking oil producers would buy forex from the interbank market. “We have clarity on that; that we are supposed to get money (foreign currency) on the interbank although initially, from the monetary policy we were made to understand we would get it at a special rate from the Reserve Bank of Zimbabwe because cooking oil is an essential product. “Obviously, that is not the case anymore. We have had some communication with the Reserve Bank,” he said. Asked if they are able to get foreign currency from the interbank market, Mr Mangani said cooking oil manufacturers were not getting enough to sustain key imports. “There is nothing trading on the interbank market, we are yet to see meaningful activity on that market. There are just small volumes trading, so whatever we are getting there cannot buy anything,” he said. In January, Zimbabwe’s largest cooking oil manufacturer, Surface Willmar, was forced to suspend operations over foreign currency shortages. The company, which last year acquired the country’s oldest cooking manufacturer, Olivine Industries, makes Pure Drop cooking oil and the Buttercup margarine and Olivine products brands. Other than cooking oil, Olivine also produces margarines, bakers’ fats, candles, soya chunks, beans, tomato products, curries and mustards, chutneys and sauces, fortris juices, jams and marmalades, fruits and jellies, industrial and other products. As companies’ external payments liabilities kept ballooning amid failure to obtain foreign currency for key imports, some manufacturers, including oil expressers, started quoting prices in US dollars. Another major cooking oil producer, Willowton, announced this year that it would scale down production on the back of challenges in securing foreign currency.